Here the reader is confounded once again with a stark and monumental polarity. Although now rarely recognised, it is clear that this 1819 publication bears a double title, one in German and one in Arabic. 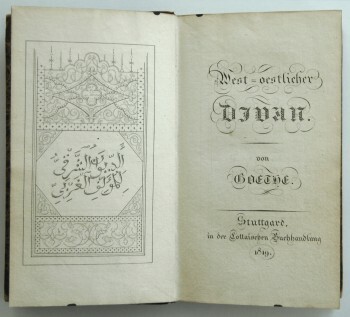 The German title is well known to us—West-Östlicher Divan—i.e. ‘The West-Easterly Poetry Collection’. The other, facing, title in Arabic is not customarily cited, and reads: الديوان الشرقى المولف الغربى ‘The Eastern Poetry Collection of the Western Author’. Surprisingly, the very title of Goethe’s work is a conscious mistranslation of itself, and consequently, at the very inception of the 1819 Divan, we are reminded that we are entering not one, but rather two works. 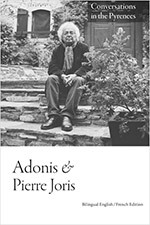 One text bears an ‘Occidental’ title of synthesis, of amalgamation; the other text bears an ‘Oriental’ title of separation, of distinction. In the language of Europe, the poem is a mixture of East and West, but in the language of the Near East, the ‘Collection’ is itself wholly Eastern and the ‘Author’ is wholly Western: the الدوان (\ad-diwan\Poetry Collection) is الشرقى(\ash-sharqi\Eastern) and the للمرلف (\li’l-mu’allif\Author) is الغربى (\al-gharbi\Western). According to his Arabic title, Goethe’s work is not dialogical but monological, not synthetic but integral. One could of course ask the question, which came first, the German or the Arabic title? Goethe is working with and from Hafiz’s poems — though most likely more with the new translation into German, than with the Arabic text itself, though who is to say? This fascinates me deeply, and I need to do research and writing in this area — time permitting. In past essays I have tried to track how (m)other languages haunt the literary text and inflect it, posing translation conundrums. Goethe’s inscription of a profound difference of view-point in the two languages of his title seems like fertile ground for meditating further on these matters.